Joyce Glasser reviews Hannah (March 1, 2019), Cert. 12A, 111 min. Italian co-writer and director Andrea Pallaoro’s (Medeas) Hannah, isn’t giving much away. There is no expository dialogue or narration; there are no captions or flashbacks and there is precious little in the way of conversation to orientate us or provide a narrative thrust. There are instead little hooks that, like a climber, you must latch onto to inch your way through the story, wondering whether the view from the summit will be worth it. 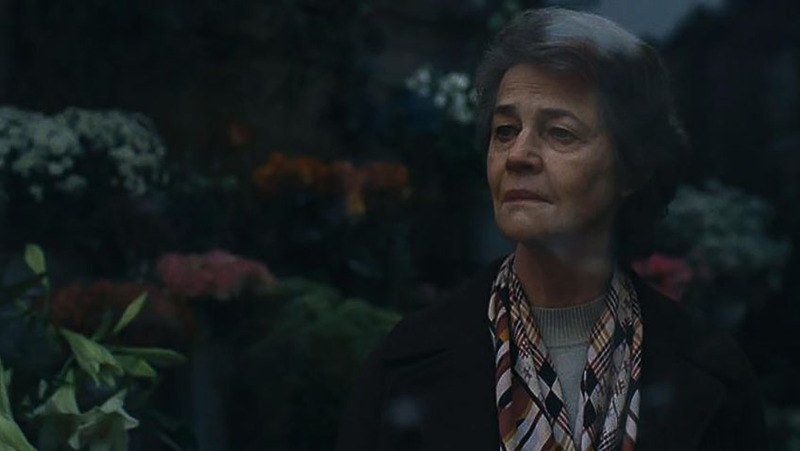 And then there is Charlotte Rampling in a study of pain and loneliness that is so relentless, it cannot really be called entertainment. Close up on a septuagenarian woman (Rampling) who is emitting shrill sounds, like a dying animal. Then we hear a similar sound off –camera and when the camera pulls back we realise we are in a drama class. After more exercises the weekly class is over. A septuagenarian (André Wilms) male in a big jumper who has not bothered to shave is eating a meal which a woman has just prepared. We assume she is his wife although neither of them is talking. When the light bulb in their shadowy kitchen goes out, the man calmly changes it and returns to the table to finish his coffee. You’d never know the man is getting ready to go to prison. After saying a fond farewell to his King Charles Spaniel, the man asks the woman, whom we now recognise from the drama class, if she is ready and they take a taxi to the prison. We do not know the nature of the man’s crime or the length of his punishment and are never told. The woman is Hannah. She clearly wants life to continue as normally as possible, but it’s a losing battle. Pallaoro shoots Hannah through half open doors, through mirrors, in shadow and from behind in medium shots as a fragmented and marginalised person. It is also difficult to assess her social status from her home, although it appears spacious and comfortable, if very dark and old fashioned. But Hannah works as a maid in a modernist house where the owner reads to her disabled son about a beached whale found on the coast. Did Hannah always do this job to supplement her, or her husband’s income or is this work a more recent necessity? We know nothing about Hannah’s background, or her husband’s. And what meaning can we attach to a damp spot on her ceiling emanating from the bathroom upstairs where Hannah finds children in ‘orange water’. It’s a nice touch to force the audience to uncover a mystery, but we have to understand the clues. At home Hannah emphatically closes all the curtains and blinds, either to shut out the world or to leave herself in the darkness, or both. She moves the dog away from the front door, telling him, ‘he’s not coming home,’ before curling up on her bed with the animal who is too distressed to eat. The loneliness and isolation are palpable. Hannah continues to visit her husband, telling him lies about her devastating visit to their son Michael’s (Julien Vargas) house for their grandson Charlie’s birthday. The reality, which we witness, is much more painful as their son tells his mother that she is not welcome in his house. The crime is looking a lot like child abuse, but all the prisoner can say to Hannah about their son’s comments is, ‘I will never forgive him – and you shouldn’t either. How can a son do something like that to his father?’ Is Hannah’s husband more delusional than she is? He tells her that they are transferring him. Even her husband is disappearing from her life. Little by little all that connected Hannah to her life is vanishing. Her son and grandson, who she watches through the school gate are off limits; her pool membership is revoked, without explanation and even the dog, who now will not eat, has to be given away. One afternoon Hannah asks for the afternoon off, saying she is not feeling well and goes to the coast to see the beached whale. In late 2018, after the film was written and possibly after it was completed, a fin whale was washed up on a beach outside of Bruges, one of several mysteriously washing up on the shore as in the film. But it is never clear why Hannah feels the need to witness the decomposing body and the metaphor appears haphazard, as if it’s from another film. What happens to a suburban housewife when her husband, ostracised by society and by his own family, is incarcerated? 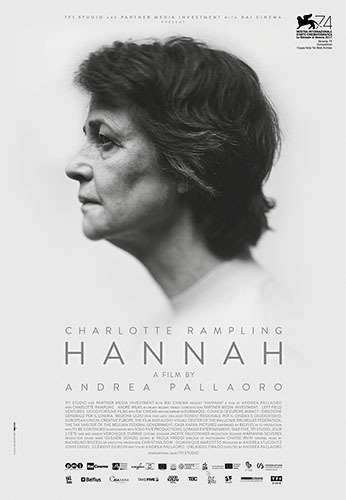 Rampling explores this question in a quietly explosive performance as the eponymous 70-something woman who is clinging desperately to a life while everything, and everyone in it, is falling away from her. It’s an interesting concept for a rich character study, but Pallaoro’s self-conscious style and reluctance to prove a narrative or context tends to undermine the film’s potential.